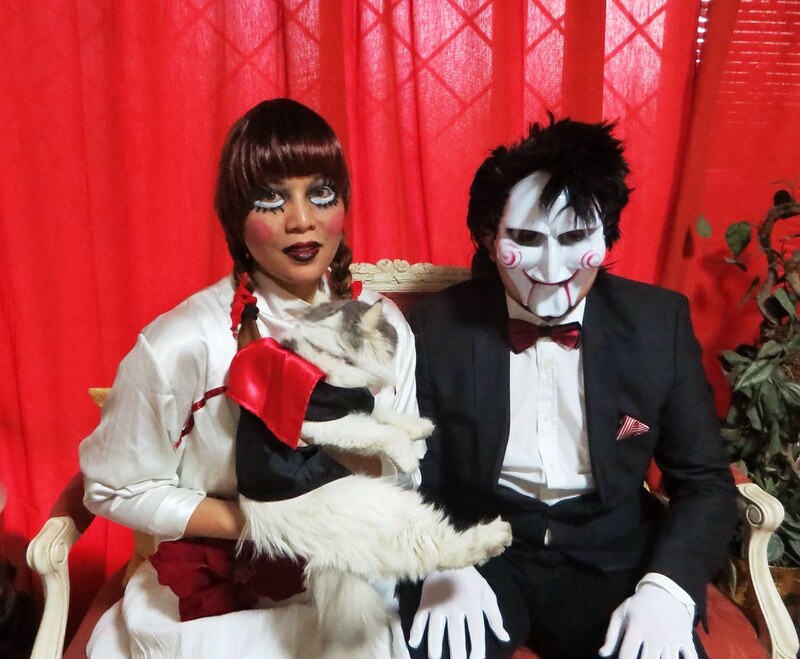 Halloween 2014: Annabelle the Doll & Billy the Puppet. I love Halloween! When we were kids, my mom would dress us up in costumes every year. 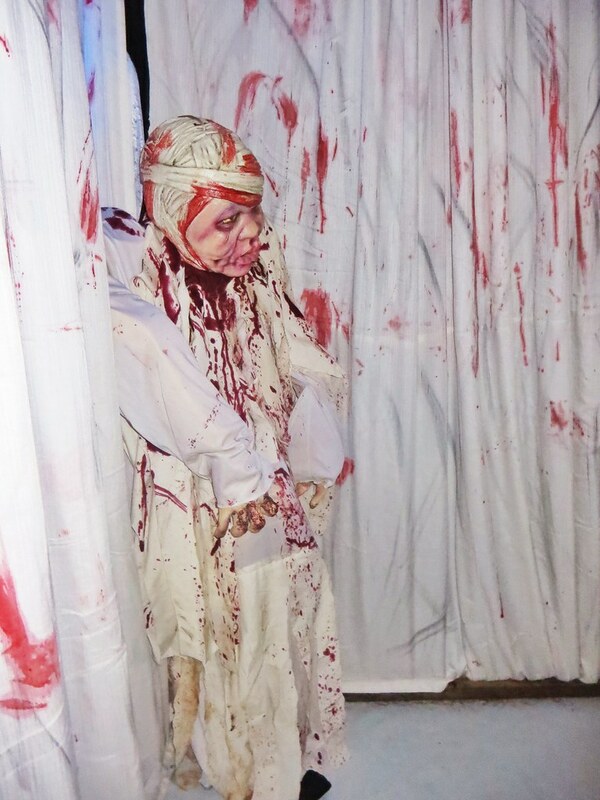 Luckily, our village always practiced trick-or-treating, even before Halloween was widely celebrated in the country. Streets were filled with adults and children in costumes, all of the houses had spooky decors and either a scary surprise or chocolate and candies for trick or treaters. I actually miss those days when Halloween was not yet too commercialized and 'found' just about everywhere. Regardless, I still love Halloween and prepare costumes for me and T every year. But at the last minute, T will tell me he doesn't feel like wearing them so we end up not going in costume at all. This year is our 8th Halloween and I wasn't really expecting anything anymore. But when T bought masks and consulted me about his costume, I got excited and we talked about what we were going to be. 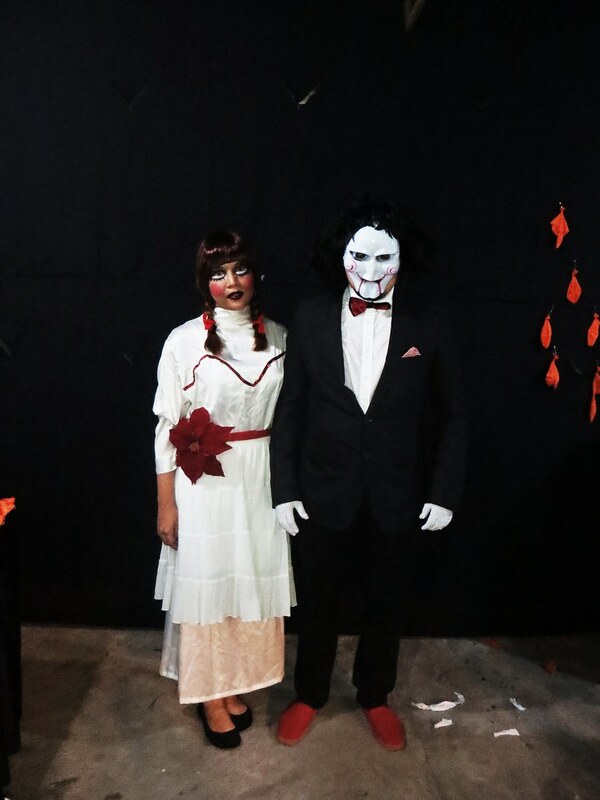 T and I had a number of options but at the end we decided to be Annabelle the Doll from The Conjuring and Billy the Puppet from the Saw movies. 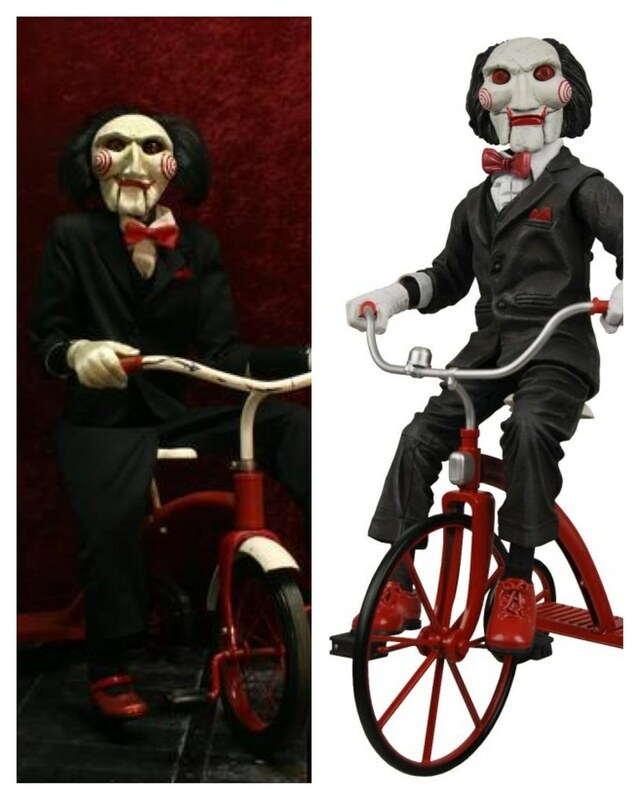 Billy is the puppet who appears on his trike to deliver the "rules" of the game to people imprisoned by a serial killer in the Saw movies. The concept is just too gory for me so I only watched the first one where Billy asks the two men locked inside the room to cut off their feet or die. 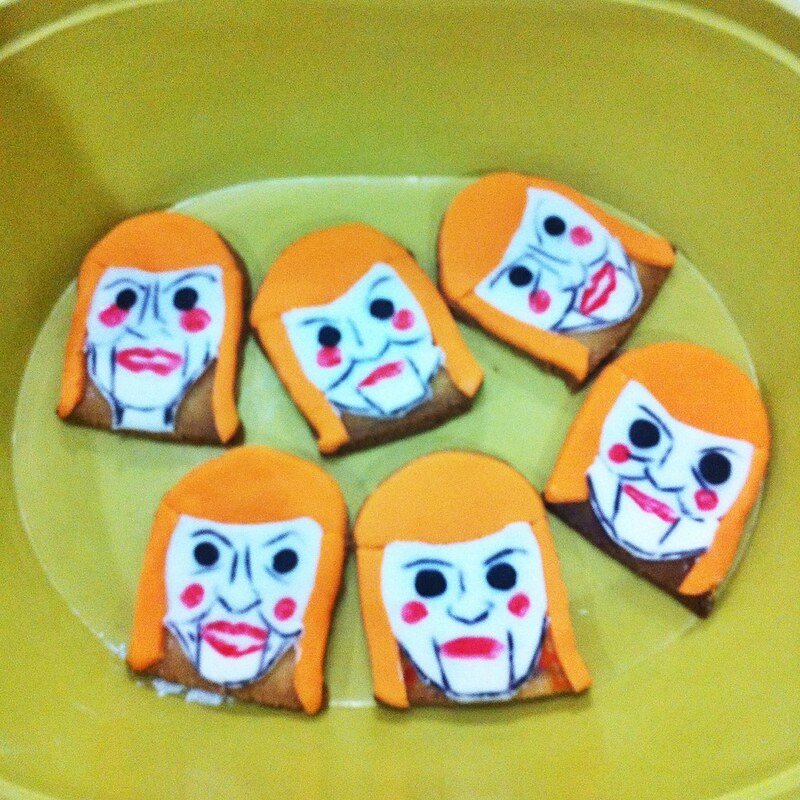 The day before Halloween, T made Billy the Puppet and Annabelle the Doll cookies to give away as treats for his shop. So cool! While he did this, I practiced my makeup. I think I'm already immune to the doll's face because I had to Google her photos and watch clips from The Conjuring and Annabelle to get the facial expressions. I love T's costume! He has all of the details down pat, including the red pocket square. We actually consider finding a red tricycle but decide that it would be a hassle to carry during the party. 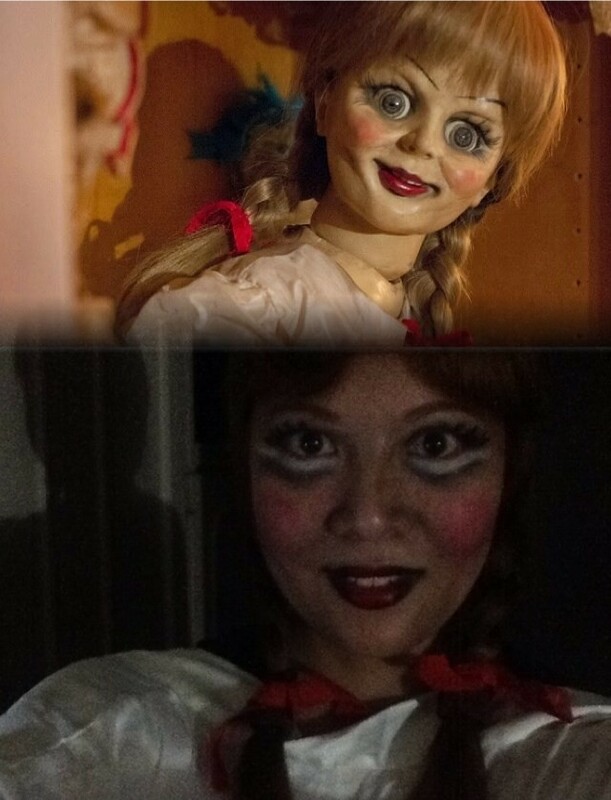 My Annabelle costume is just DIY! I conceptualized the look and bought the materials while my mom sewed everything, including my dress and belt. Luckily, I am able to get clip on bangs for only 120pesos ($2.50) that's almost the same color as my hair so I don't have to wear a wig. 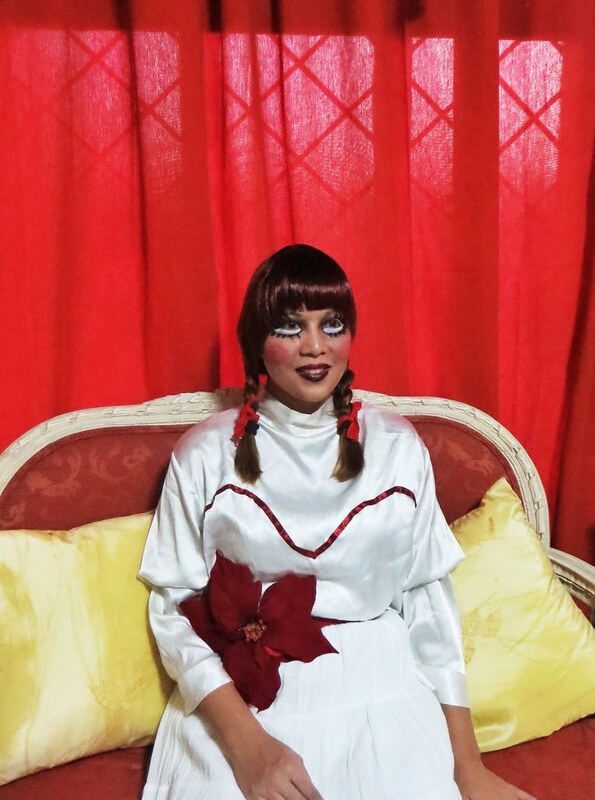 I really want to do a DIY step-by-step blog post about my Annabelle costume but am not able to take photos because we are pressed for time. 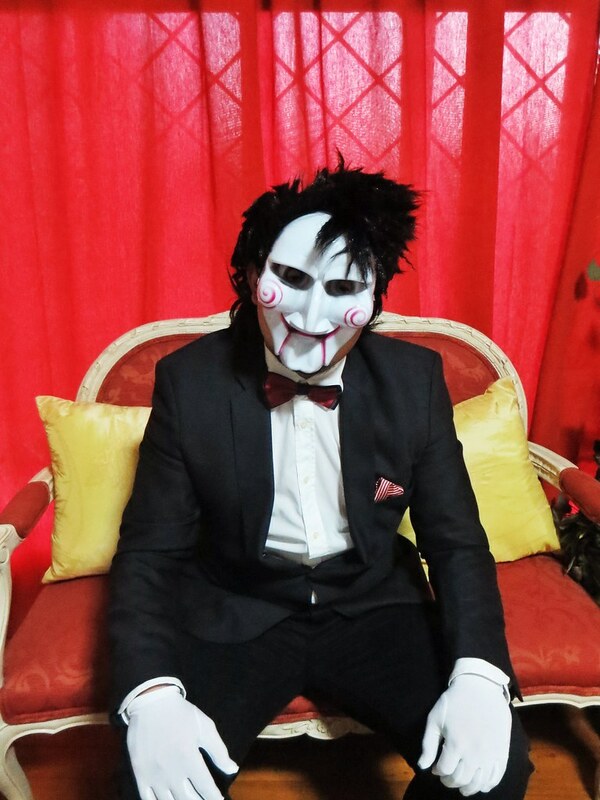 But all in all, I spent less than P800 ($20), including T's gloves, bow tie, and wig. But the little one gets scared of us and runs away. My makeup is not yet done but it's getting late so I pack my stuff and decide to do it while in the car. After an hour on the road, I discover that I forgot my makeup kit at home. Bummer! So I tell T and his friend Odi Vicente, who is riding with us to the party, that we need to find lipstick and eyeliner somewhere. 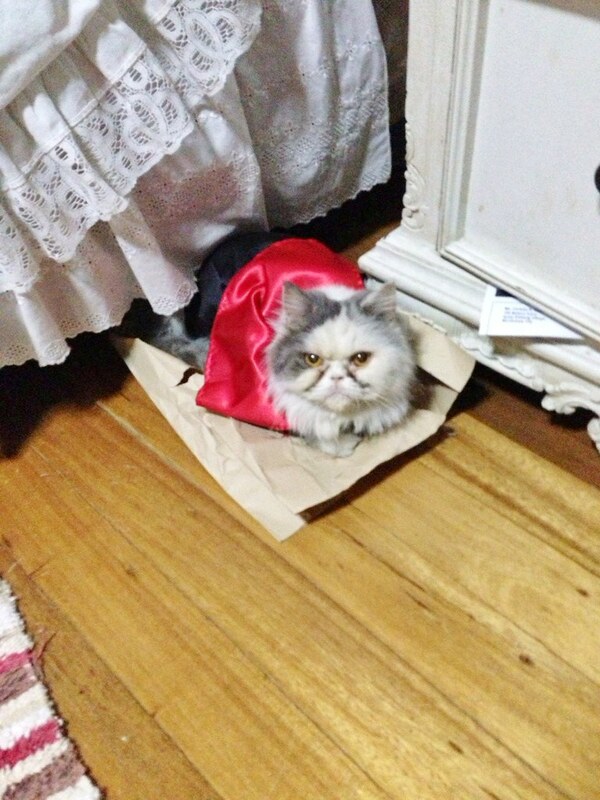 Odi and I enter a couple of groceries and convenience stores, forgetting that I am in costume. The guard of Pure Gold almost faints because he sees me coming from the dark. The cashier in 711 takes my photo. Kids run away from me. Funny! We go to the house of T's friend, Martin Castro. 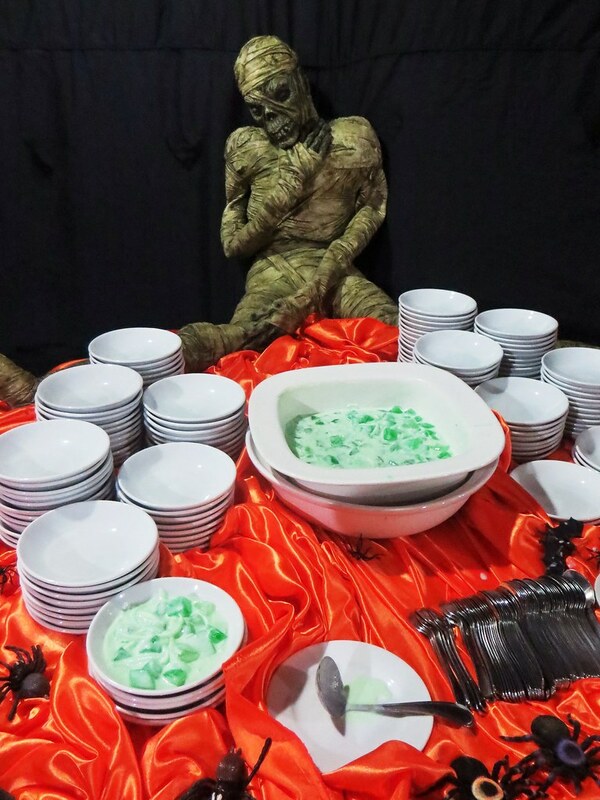 He and his wife transformed their house into a haunted one. It's a full production complete with scary dead people, zombies, lights, sound effects.. the works. Plus, you can only go three at a time (in our case they made an exception and allowed four people.. Me, T, Odi, and another friend of ours JR Francisco) so that raises the scare factor up a couple of notches more. 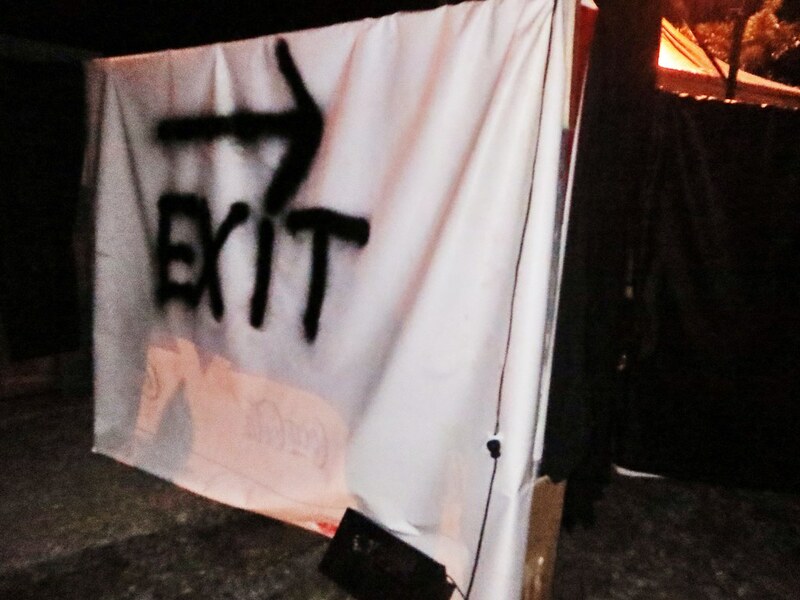 As soon as we enter, we scream as we are greeted by a zombie hiding behind the curtains. Then we see a hallway covered with paintings and T comments that they are so lifelike. As soon as he stares at one of them, the frames on both sides fall and dead people appear and reach out to us. T gets so surprised and sits on the floor while Odi makes his way back to the entrance, trying to escape. But the people in front tells us there is no going back so we have no choice but to proceed. 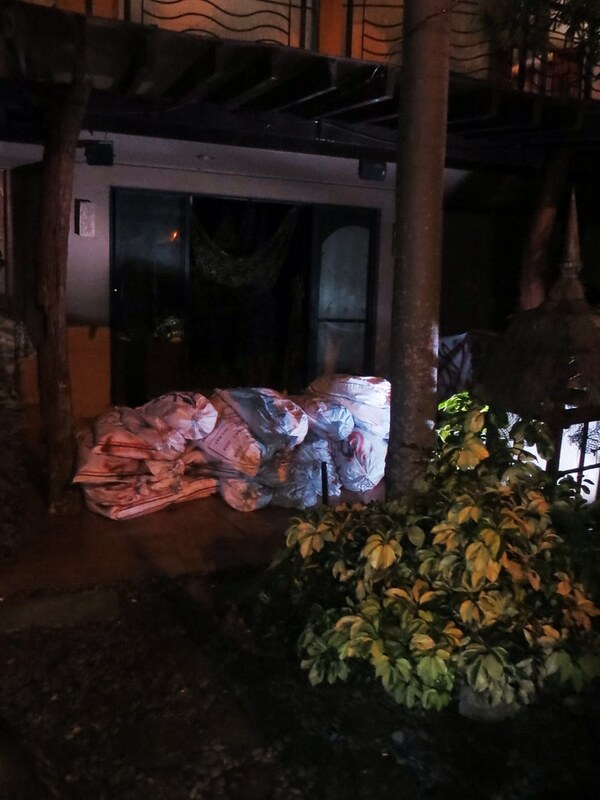 I don't remember screaming this much inside a horror house since the Bahay sa Balete in Big Bang sa Alabang. So scary!!!! Kudos to the Castro family for creating three levels of pure fear! 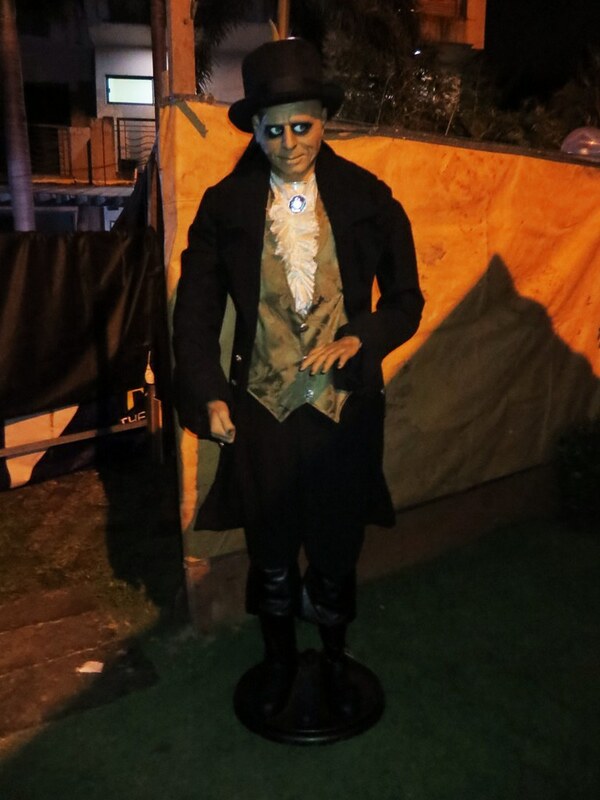 But even outside the house you are not safe because there are ghouls like this guy. 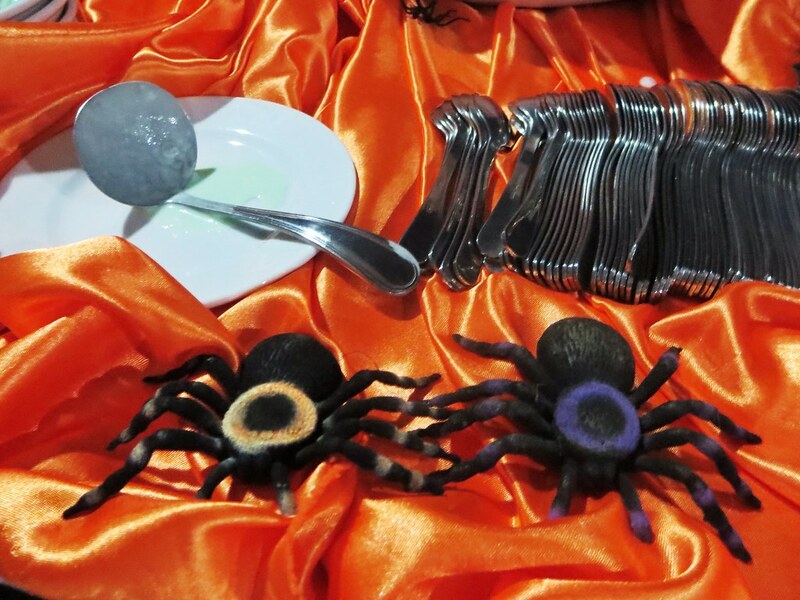 Also love the little details like these spiders on the buffet table. This is our friend Odi who is dressed as Osama Bin Laden. 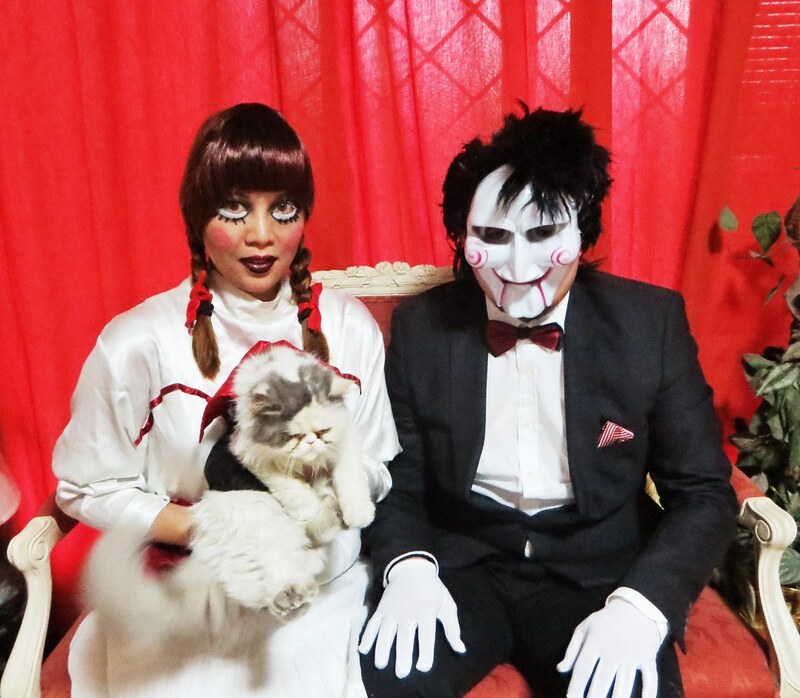 Before I leave, I take a photo with Martin's wife dressed as a zombie bride (uber cool makeup!) 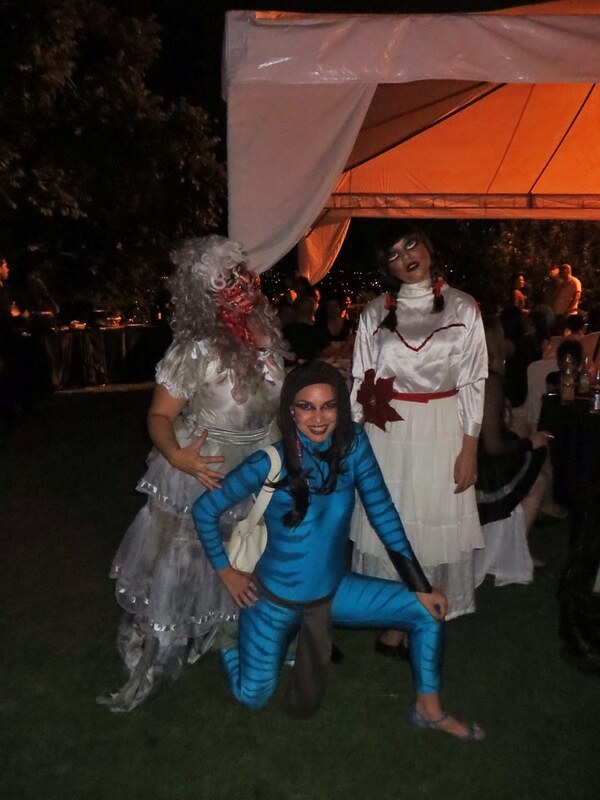 and her friend dressed as a character from Avatar. 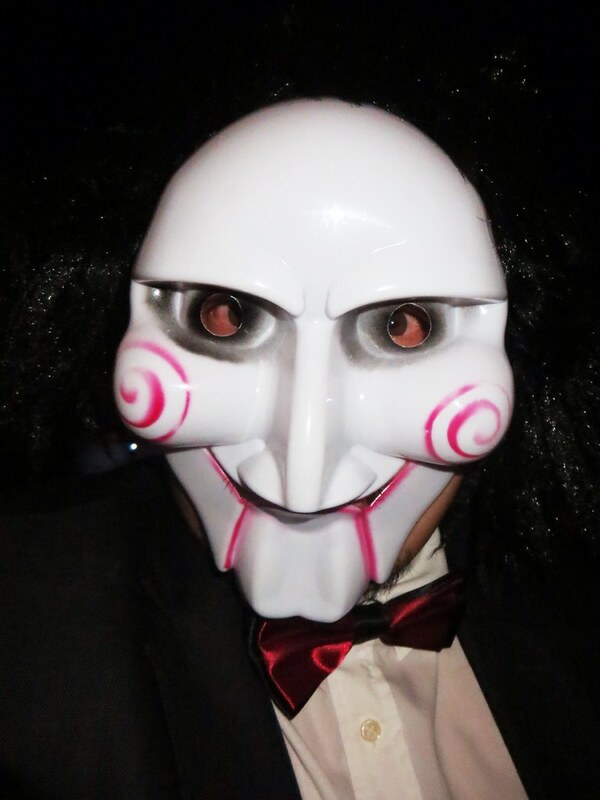 ...and Billy the Puppet. See us in your dreams! 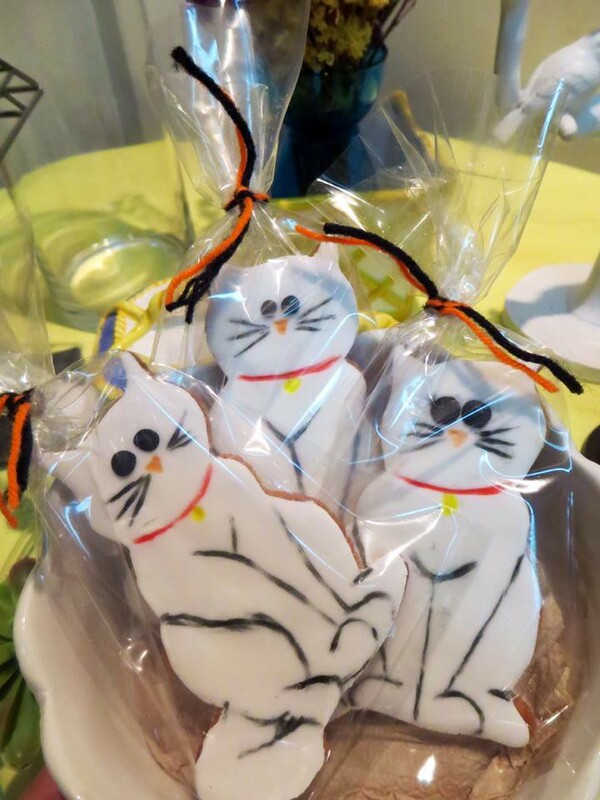 Halloween is not really a celebration here in kuwait. I miss those times when I was still in PH. You really scared me with the Anabelle custom. Those pictures are very entertaining! Thumbs up! I am not really a Halloween type of person. Your costumes are so well-done and amusing if you have seen the films. 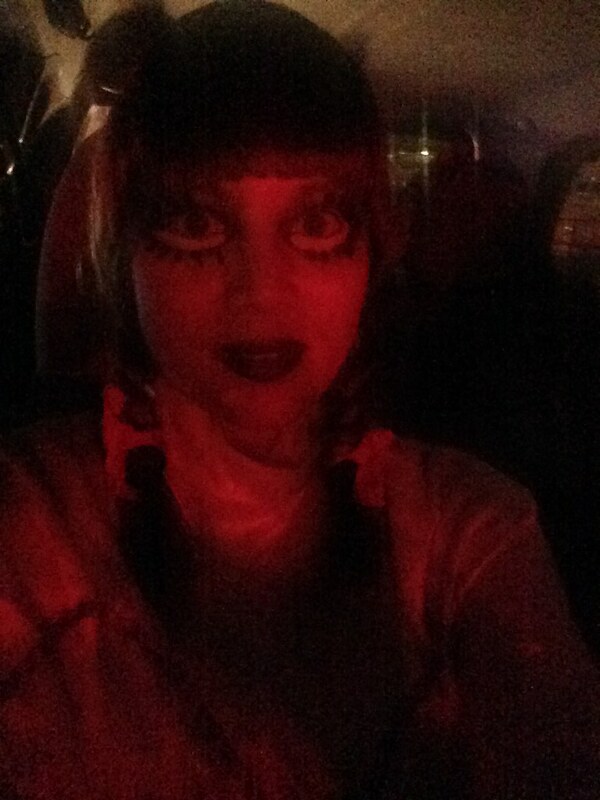 Funny about buying the makeup in the convenience store while in costume! Haha! FRED. Yes, that was funny! I really laugh out loud when I read on how the guard at puregold almost faint seing you ha ha ha. Awesome. You did a good job on your costume. 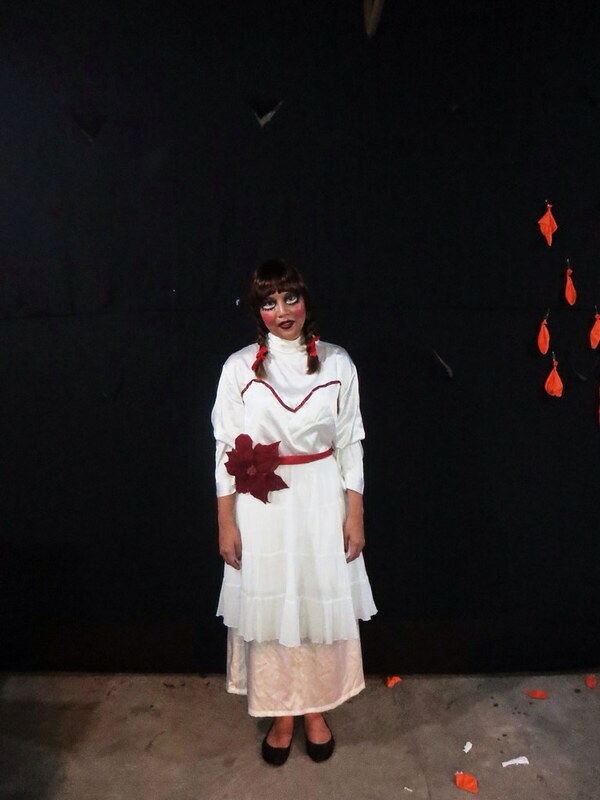 It's really scary and really look like Annabelle. Oh! 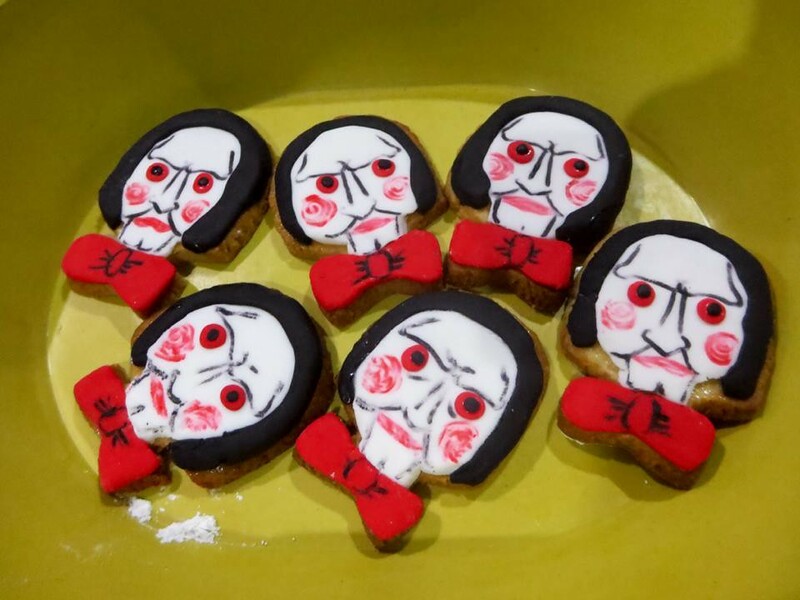 The cookies are so cute. 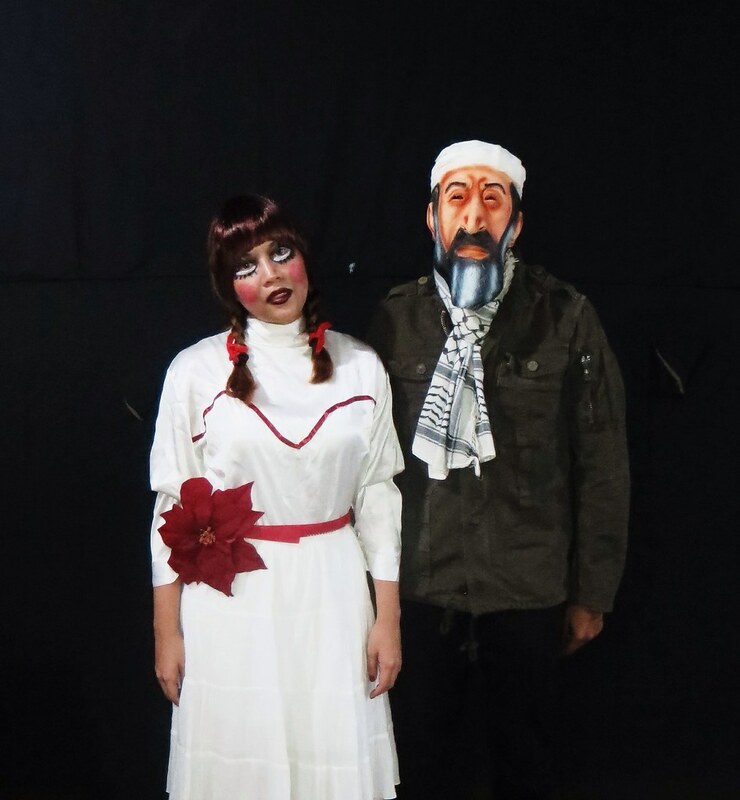 ang galing ng costumes and make up grabe :-) great job! SHERLANE. Yes we were all laughing as well! MICHYMICHYMOO. I know! I get scared now whenever I view the album again! Haha! I don't know if it was the make up was the one which freaked me out or the entirety pose. My.... nicely done. Man of many hidden talents! Haha!